*Entrance fee for the Great Wall and Forbidden City. *A licensed English-speaking tour guide and a professional driver with air-conditioning vehicle. 1. This tour is suitable for at least 12 hours layover time frame. 2. This tour is suitable for your arrival at Beijing airport at Beijing time before 5AM and departs at 5PM Beijing time or later. 3. Our meeting point is Starbucks coffee shop at terminal 3 arrival hall (beside the international exit B). If your flight arrive at terminal 1 or 2, please take the airport shuttle bus to terminal 3. But we can transfer you to terminal 1 or 2 to catch your next flight after the tour. 4. If you stay in a hotel, please go to our meeting point on your own. 5. Our tour duration is fixed, if you would like to stay longer or shorter time at each attraction. Please choose our private tour. 6. To book the tour, please pay the full payment in advance. 7. If you want to cancel the tour, please inform us before your flight landing at Beijing airport. We will refund full tour fee to you. 8. If you did not show up on time at the meeting point, we will go on with our tour. But will refund 50% tour fee to you. 9. If you have 3 or more people take the tour, we suggest you book our private tour, which is more flexible and cheaper. Hi, I will be landing on Sunday morning 4:50am. My departing flight is at 7:40pm. 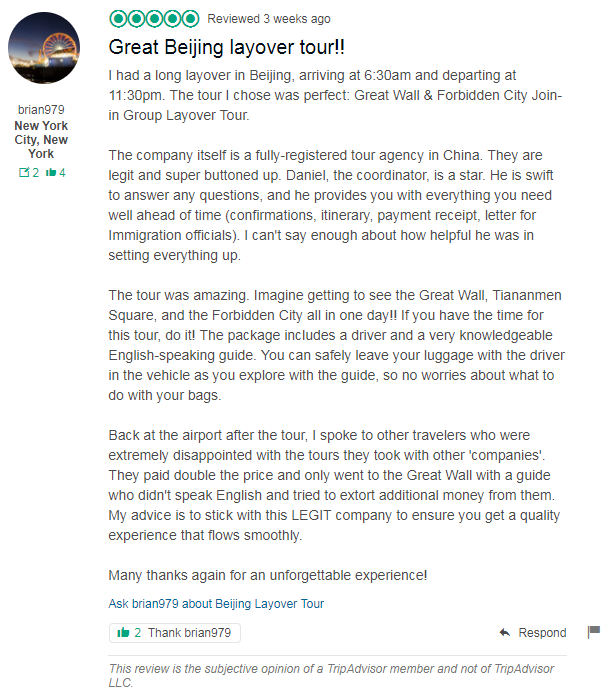 Can i join the Great wall – Tiananmen Square – Forbidden city group tour? I am travelling alone. Is your tour date Apr. 7, 2019? If so, you can join this tour. We will send an email about the tour details now, please check. Thank you! I will arrive at the airport at 5:40 AM and leave again at 6:40 PM. Is 1:40 hour enough time for the visa? Or would it be better to just book the wall tour only at 9 AM to be back on time at the airport? According to your layover time, you only can do the Great Wall group tour. If you want to visit both Great Wall and Forbidden City, please book the private tour. Thank you! Hi, My wife and I, will be arriving at Beijing airport on April 8th(Monday), 2019 at 4.50 AM. and departure time at 8.40 PM. I am interested in 1 day tour of Great Wall, Tiananmen Square & Forbidden City. Can you please email me the information about this trip. Or can you suggest abetter trip is something not available on this day. Sorry, the Forbidden City is closed on Mondays. So this tour is available on Apr. 8, 2019.